Army SSgt. Edmond L. Lo - Run for the Fallen New Hampshire, Inc.
ordnance disposal team was acting to neutralize detonated in Samarra City, Iraq..
Edmond was born on January 26, 1986 and grew up in Salem, NH with his loving parents, three sisters, and two brothers. Although he was quiet, he had a wonderful sense of humor and was an extremely kind-hearted and sincere person. His many hobbies included playing on his computer, teaching himself how to play piano and guitar, origami, and puzzles. He graduated from Salem High School in 2004. All throughout high school he was involved in the Air Force Junior ROTC program. He excelled in a lot of what he did and this was no exception. In his senior year he became a ROTC leader and was commander of the drill team, color guard and operations squadron and was looked up to by many. After graduating high school, he turned down scholarships to colleges so he could pursue his passion of serving our country. On his second tour to Iraq he was assigned to the 797th Ordnance Company, 79th Ordnance Battalion based in Fort Hood, Texas as an explosives expert. While he was away he kept in touch via phone and e-mail to those close to him. He regularly received care packages from his family, which included some of his favorite foods gummy bears and beef jerky. On June 13, 2009 he was killed when an improvised explosive device his explosive ordnance disposal team was attempting to neutralize detonated. His death left a void in the hearts of many in those who knew him. He will always be loved and remembered and his legacy passed on to the nephews and nieces he never had a chance to meet. He was survived by his parents David and Rosa Lo, sister Carmen and her husband Rakesh Hira, sister Selma and her husband Thomas Deyak, sister Lena and brotheri, three sisters, two brothers, niece, and nephew and extended family. Parents of Edmond Lo and the JROTC committee are working together to provide a college Engineering Scholarship to a student in the JROTC program of Salem High School in memory of Edmond Lo. You may help by donating any amount to the fund you are comfortable with. When a student is selected, it will be announced on this website. Donators will be listed unless requested otherwise. You can request to remain anonymous by e-mailing us at donators@memoriesofedmondlo.com. 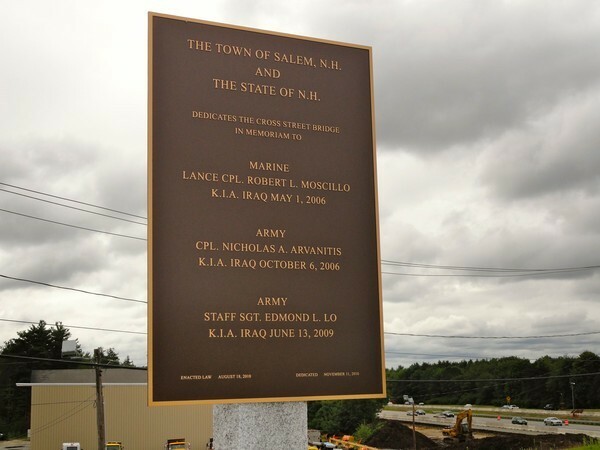 The Cross Street Bridge over Interstate 93 in Salem has been dedicated to Army Cpl. Nicholas Arvanitis, Marine Lance Cpl. Robert L. Moscillo and Staff Sgt. 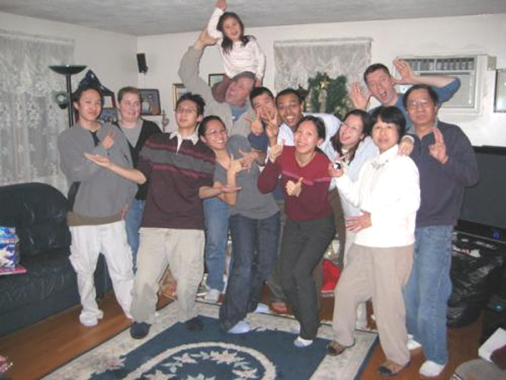 Edmond Lo all of Salem NH.